The University of Minnesota’s Visible Heart Lab has printed dozens of hearts modeled after those in its heart library. The whir of multiple printers resounds at the 3D Printing Lab at Washington University School of Medicine in St. Louis. One of the MarkerBot Replicators scrolls back and forth, laying down a 0.27mm layer of polylactic acid on each pass. After 500 or more passes, one of 50 components for a prosthetic arm appears on the printer bed. This is the wonder of 3D printing. The printed parts in this run were assembled into a mechanical and electronic prosthesis for a teenager who lost her forearm in a boating accident. Medical researchers have developed dozens more novel ways to use 3D printing in the last decade or so. At the Mayo Clinic and many other surgery centers, teams of surgeons print model organs from patients’ CT scans to consult and prepare for complex surgeries, saving time and avoiding mistakes. Cornell University scientists developed 3D-printed intervertebral discs with the intent eventually to replace damaged disks. Princeton researchers have 3D printed collagen “ears” with implanted electronics to augment damaged hearing. Surgeons in the Netherlands, China, and Slovakia have used 3D-printed parts of human craniums to repair skull fractures. Surgeons elsewhere have implanted 3D-printed pieces, such as a titanium pelvis for reconstructive surgery. 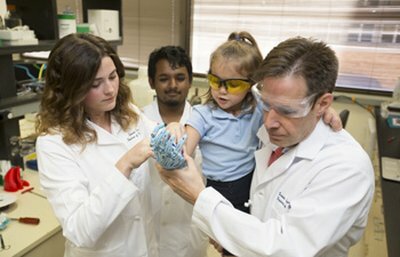 “The advantage of 3d printing is customization,” said Dominic Thompson, Jr., MA, a staff scientist in the Division of Minimally Invasive Surgery’s Bio-materials Lab at Washington University School of Medicine in St. Louis, who is leading efforts to create prostheses for children. And the prices for 3D printers have plunged since the technology was introduced in the 1980s. A high-quality industrial 3D printer still costs thousands of dollars, but even a basic unit for little more than $300 can produce models suitable for patient presentations. Thompson had been experimenting with 3D printers to produce mesh for hernia surgery when his undergraduate biomedical engineering students happened across a website outlining a plan for low-cost 3D-printed mechanical hands. “We thought, oh, wow, this is really cool,” said Thompson. Thompson and his students began working with Charles Goldfarb, MD, a pediatric orthopedic surgeon at the medical school. Together, they improved the mechanical battery-powered hand that Dr. Goldfarb and his undergraduate engineering students had made for the 14-year-old boat accident victim. In 2015, they 3D-printed robotic hands customized for two of Goldfarb’s patients. The mechanical and battery-powered hands included myoelectric sensors in the attachment that translated electrical impulses from the users’ intact muscle groups on their forearms and biceps to movement of the hands and fingers. Thompson envisions that 3D printing will help kids get affordable prostheses until they are fully grown. “A kid can tell me what color they want their prosthetic. They can tell me to put dinosaurs and fishies on their mechanical hand. If you do that and you give that to the kid, it’s theirs. They’re much, much more likely to use it.” Once the child is fully grown, insurance will cover the more expensive prosthetic hands they will likely use for decades. Robroy MacIver, MD, a pediatric cardiothoracic surgeon at the Children’s Heart Clinic in Minneapolis, is using 3D printing to predict where blood clots might travel in an effort to reduce the chance of stroke. MacIver implants left ventricular assist devices to increase blood flow from defective hearts. A surgeon has some latitude in where to connect the pump to the aorta. MacIver wondered how that choice might affect the movement of blood clots, especially to the patient’s brain. So MacIver teamed up with Filippo Coletti, PhD, assistant professor of aerospace engineering and mechanics at the University of Minnesota, who uses 3D replicas to study flow through objects as varied as lungs and gas turbines. Using CT scans of MacIver’s patients, Coletti printed 3D models of their aortic arches. Then he scanned the flow of water through each model with an MRI. The two researchers could see how the flow through the aortic arch changed as the pump connection changed location. Every year, 200,000 Americans lose feeling or movement because of nerve damage from diseases such as diabetes or injuries from accidents. Michael McAlpine, PhD, associate professor in mechanical engineering at the University of Minnesota, found a way to stimulate those nerves to regrow in lab rats. Using a 3D printer, McAlpine created branched tubes of silicon that stimulate and guide nerve growth. He began by scanning the rats’ sciatic nerves, which control their back legs. From the scan, he 3D- printed silicon tubes of the exact size and branching pattern. Project collaborator Xiaofeng Jia, BM, PhD, associate professor at the University of Maryland School of Medicine, then cut out a half-inch length of each rat’s sciatic nerve. He sutured the silicon guide onto the ends of the nerve endings. At first, the rats stumbled as expected. But the nerves were able to regrow. Within three months, the rats scampered about normally. An artifact of printing—long parallel grooves running the length of the tubes—provided further guidance to the growing nerves. McAlpine has since discovered he can lay down biomolecules such as proteins inside the grooves as part of the printing process to direct nerve growth. “These advances may pave the way toward stimulation of complex nerve injuries for faster recovery,” said McAlpine. Perhaps the holy grail of medical 3D printing is bioprinting—printing of skin, blood vessels, or eventually an organ as complicated as a kidney or heart. Bioprinted organs would mean no wait time for a donor. By incorporating a patient’s own cells, a custom-made organ would be an exact match, without the potential for rejection by the patient’s immune system. That is the goal of scientists at the Wake Forest Institute for Regenerative Medicine (WFIRM). For years, WFIRM scientists laboriously manufactured tissues by hand for transplantation. “It was obvious to us back then…that if we really wanted to expand the technology, we needed to automate the process,” said Anthony Atala, MD, the institute’s director and W.H. Boyce Professor and Chair of the Department of Urology at Wake Forest University. About 14 years ago, scientists jury-rigged an ink-jet printer for the task but soon abandoned that in favor of building a specialized printer from scratch. They designed nozzles that could lay down a stream of cells 1/80th the diameter of a human hair. Then they formulated cell-laden hydrogels and biodegradable polymers that would transport cells yet provide enough strength and stiffness to hold a shape. They also created microchannels, on the scale of capillaries, to carry blood and nutrients “until the vessels had a chance to come in and revascularize [tissue],” Atala added. 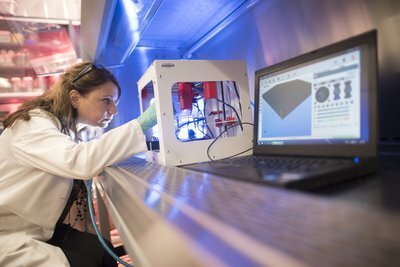 In a paper published in Nature Biotechnology, the Wake Forest scientists presented an account of how a 3D- printer created jaw and skull bone, cartilage, and muscle tissue, which were implanted in mice and rats. The constructs had the necessary strength to function in humans. And they “matured” in the animals: the living cells continued to accumulate in the implanted tissues, and a network of nerves and blood vessels invaded the material. 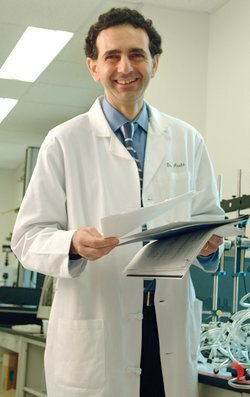 Jonathan Butcher, PhD, associate professor of biomedical engineering at Cornell University, is banking on bioprinting to solve two problems in creating a living replacement heart valve for patients. First, 3D bioprinting can duplicate the deceptively complex and difficult-to-mold shape of a heart valve, by printing the valve from a patient’s own CT scan. “You need to replicate those complicated features to be able to do the same function efficiently,” he said. Second, a heart valve bioprinted using a patient’s own cells might grow in size. And a patient’s printed stem cells might react to the local environment as needed. “You have the capacity for generating a valve that has a patient’s anatomy but is also able to interact with the body’s natural signaling to potentially grow and remodel,” Butcher said. A growing replacement valve might mean that children could avoid multiple surgeries. Butcher has implanted heart valve tissue into lab rats to check for an immune reaction. “We wanted to make sure the material didn’t disintegrate. We also didn’t want to see a massive inflammatory response,” he said. Just as important, the animal’s cells began migrating into the structure, which remodeled over time.